When you want quality and excellence in both style and comfort in your rental car then you need look to the Volkswagen name. 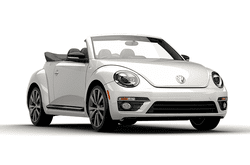 The Beetle Cabriolet is unashamedly style-focused, but it's stable and nimble enough to satisfy in everyday driving. There's plenty of space in the front seats, and the boot is a decent size too so it is great for couple’s getaway, shopping trips, sightseeing, and more! It has great millage rates and is packed with all the latest features and accessories you would come to expect from a luxury vehicle. You will not regret booking the Volkswagen Beetle Automatic for your travel and transportation needs.